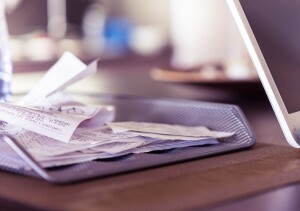 When you are getting your financial records organized, it is important to keep track of your spending, so it is important to keep track of receipts. Fortunately, you don’t need to keep most receipts very long. Unfortunately, there are some you might need to hold on to almost forever. Will I want to return this purchase later? Is this purchase accounting for 10% or more of what I expect to spend this month? Do I want to claim this purchase on my taxes? This might add an extra second to your transaction time, but that second can add up big time! This is the easiest one: in almost every case, you will have a very hard time trying to return a purchase that had some sort of problem (or regret) unless you can prove you paid for it. This means that for clothes, appliances, and everything else that can break, you will want to save the receipt. How long should I save them? Returns are usually accepted only within 30 to 60 days of the purchase, so you can generally throw these out the next time you do an account reconciliation. Receipts you are saving in case of returns can also be saved separately from your other more permanent financial records, making it easier to throw them away regularly. If you think this purchase will account for 10% or more of this month’s spending, you should keep the receipt for that month’s account reconciliations. These can be bigger, and so you definitely want to double check to make sure you weren’t over charged, but also to be sure that you get accurate totals for your 10-minute reconciliation records. If you do not need these for tax reasons, you can safely throw these away as soon as you finish your account reconciliation. If what you bought can be claimed on your taxes, you need to keep your receipts much longer, and it is a lot more important to keep them organized. You might also be surprised at how much you can claim in your taxes. Paid any tuition or job training? You can claim it! Did you need to buy something required for work, like a uniform? You can claim that too! Depending on where you live, you might also be able to claim what you spend on public transit, any improvements to your house, and much more. You might need to consult a financial consultant or accountant at least once to know exactly how much you can claim in your area. If you claim something on your taxes, you need to keep the receipt for at least 7 years – this is the threshold for the IRS to audit your tax filings. If the IRS does decide to audit you, you will need to provide the financial records proving you spent whatever you claim you spent. Then, once every year, you can ceremoniously throw away all the receipts from 7 years ago to make room for a new batch! 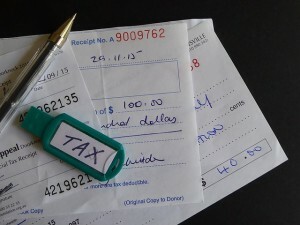 1 of 5) How long should you keep receipts used for tax claims? 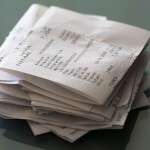 2 of 5) How long should you save receipts for small purchases that cannot be returned? 3 of 5) What would the Sub Total of this receipt be? 5 of 5) You made this purchase with a credit card, and this store charges a $1 fee for credit card purchases. 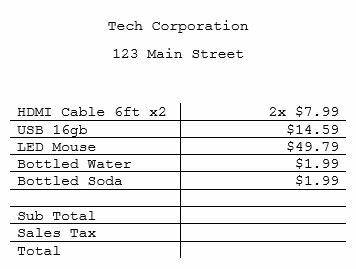 With the same taxes as before, what is your total purchase amount?